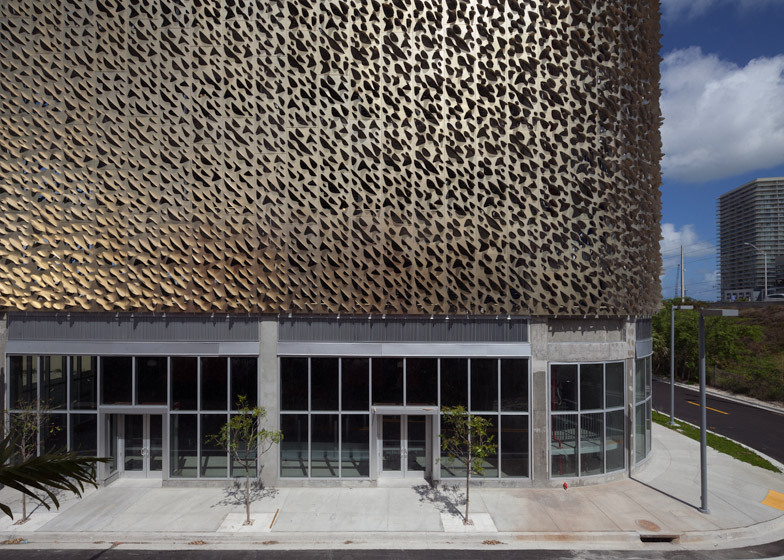 This parking garage in the Miami Design District features a textured facade of perforated metal panels, designed by architecture firms IwamotoScott and Leong Leong, with artist John Baldessari (+ slideshow). 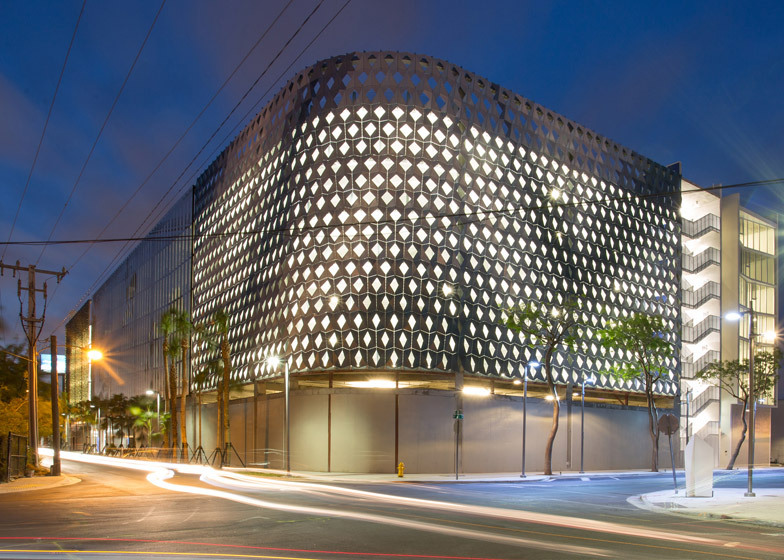 The seven-storey, 283,000-square-feet (23,300 square metre) City View Garage contains 599 parking spaces as well as a ground-level retail space and is situated on the edge of the Design District, near a major highway. 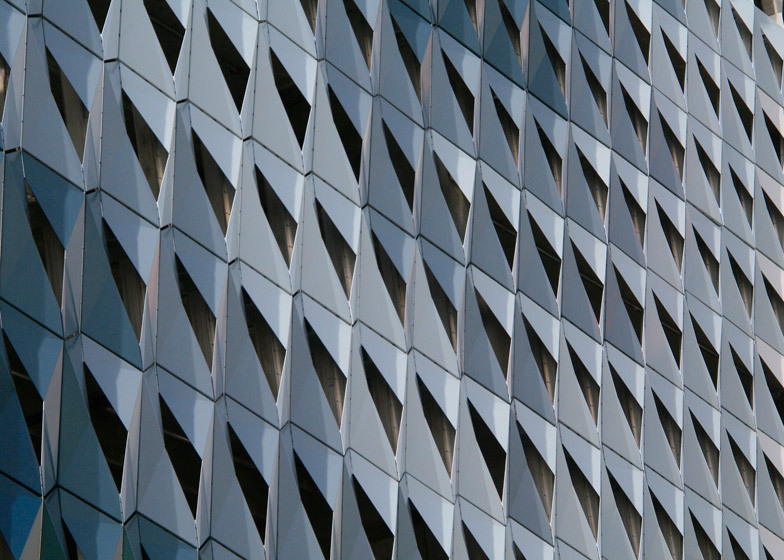 San Francisco-based IwamotoScott designed the building's southeastern facade, which features a tessellated composition of aluminium panels. 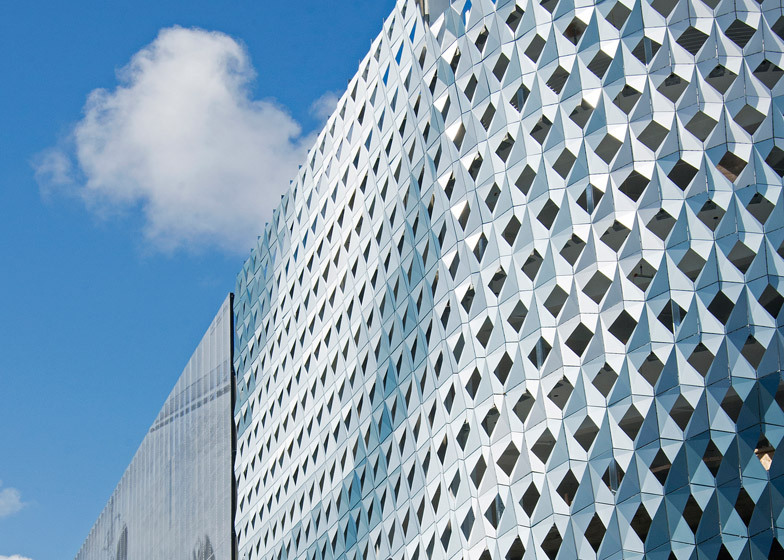 Comprising diamond-shaped apertures in six different sizes, the blue-tinted screen hides concrete slabs and enables natural ventilation. 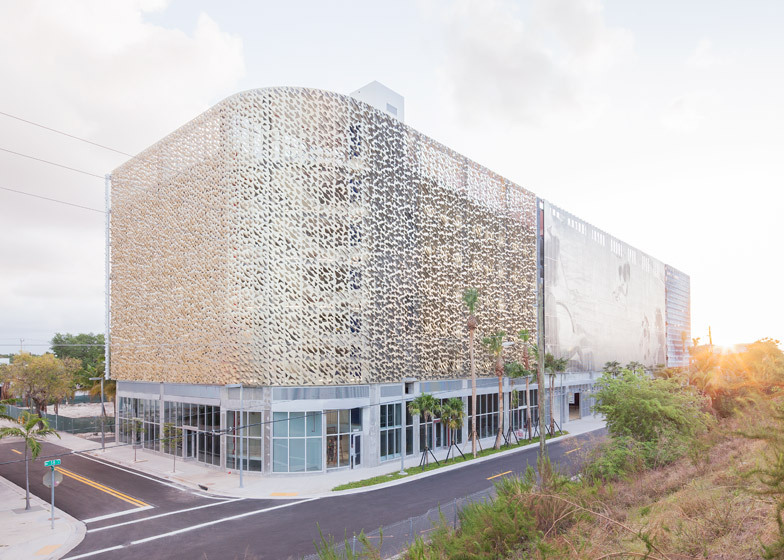 "The building's facade has a strong presence from the freeway, and thus acts as a kind of billboard for the Design District," said IwamotoScott. 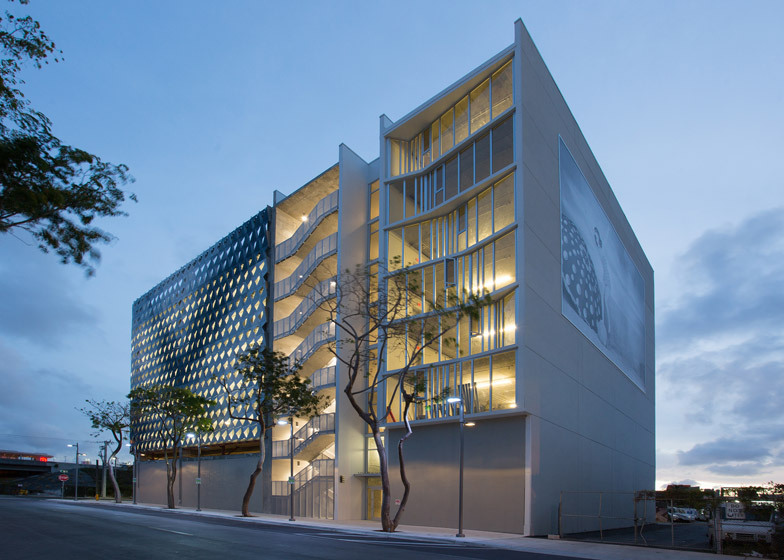 "The client brief requested avoiding the need for mechanical ventilation for the parking structure," the firm added. 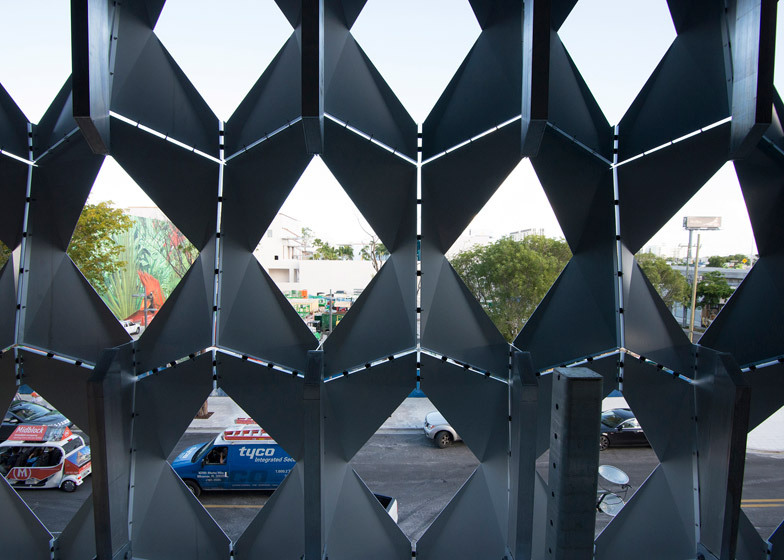 "As such, our design employs a digitally fabricated, modulated metal screen whose folded aluminium modules of varying apertures yield a total porosity that allows for natural ventilation." 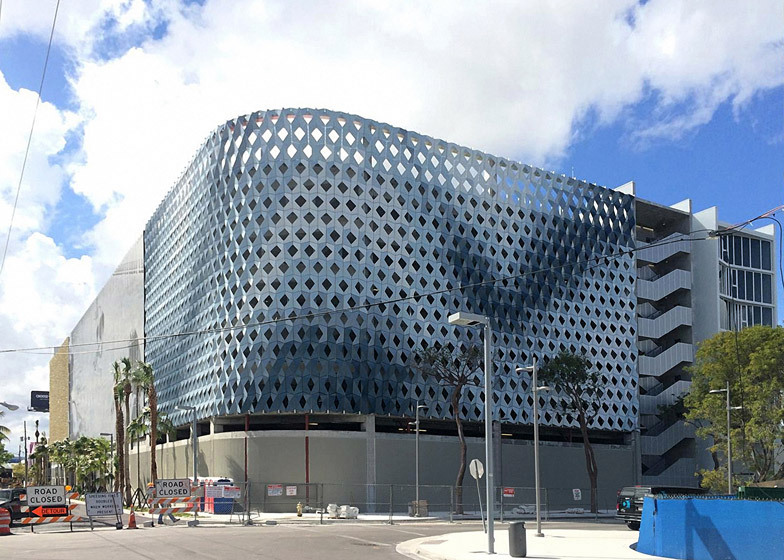 Leong Leong, a firm based in New York and Los Angeles, created the western portion of the facade, sheathing it in titanium-coated stainless steel panels. 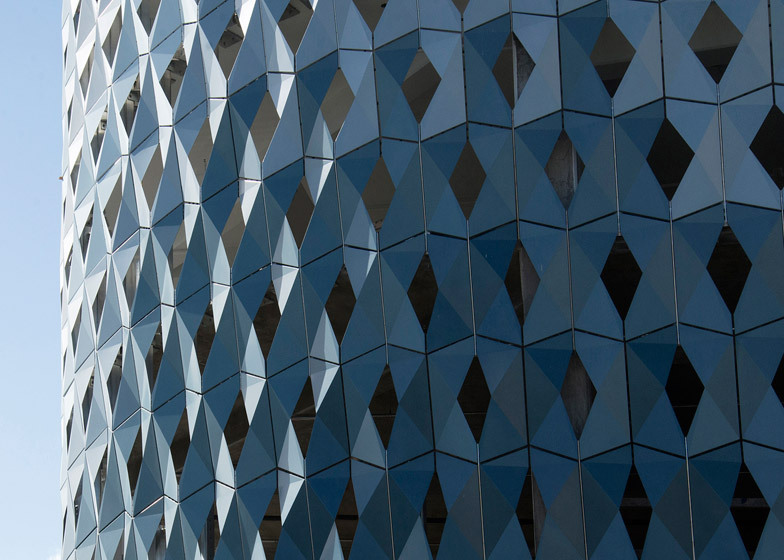 "The facade, which is a pattern of curvilinear shapes punched and bent out of titanium-coated stainless steel, creates a visual effect that looks like the shimmering patterns of light on the surface of water from a distance,"said firm partner Christopher Leong. 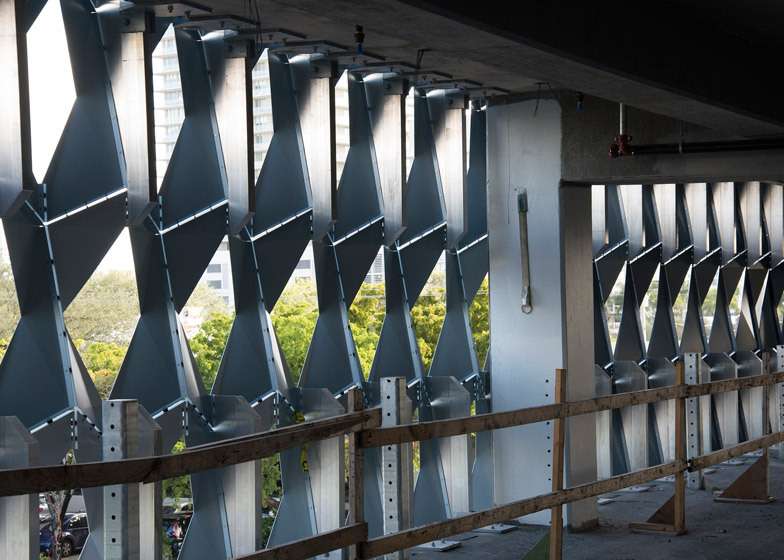 "From below, it looks like the foliage of a palm tree." "The result is a surface that simultaneously radiates and dissolves," he added. 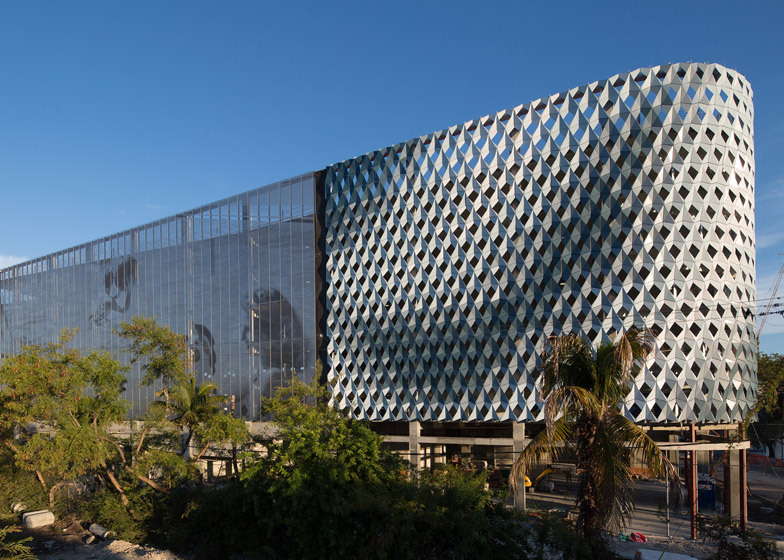 Leong said his firm was intrigued by the idea that a single structure can have several identities. 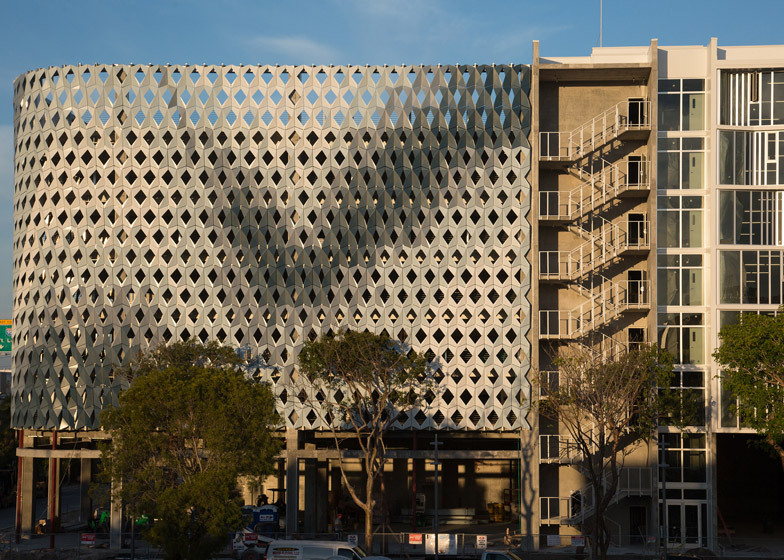 "The different facades give the building an experience at multiple scales and vantage points," he said. 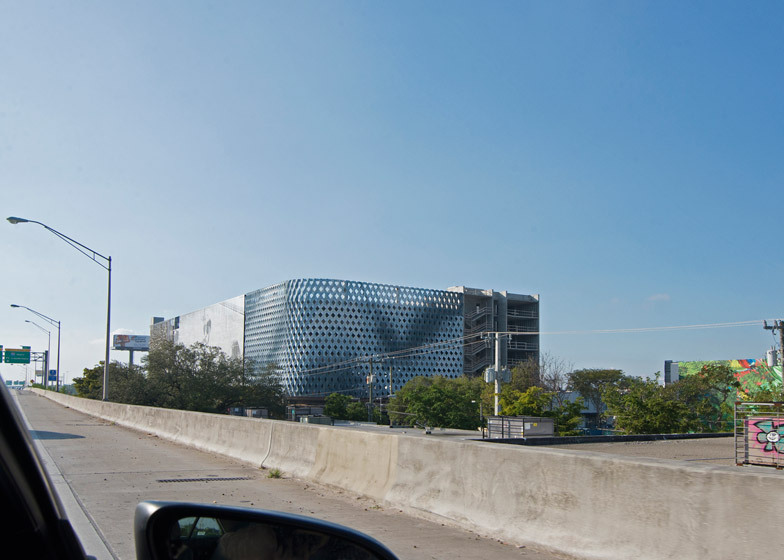 "Moving past in a car, the south facade runs parallel to the freeway and appears like a three-dimensional billboard. 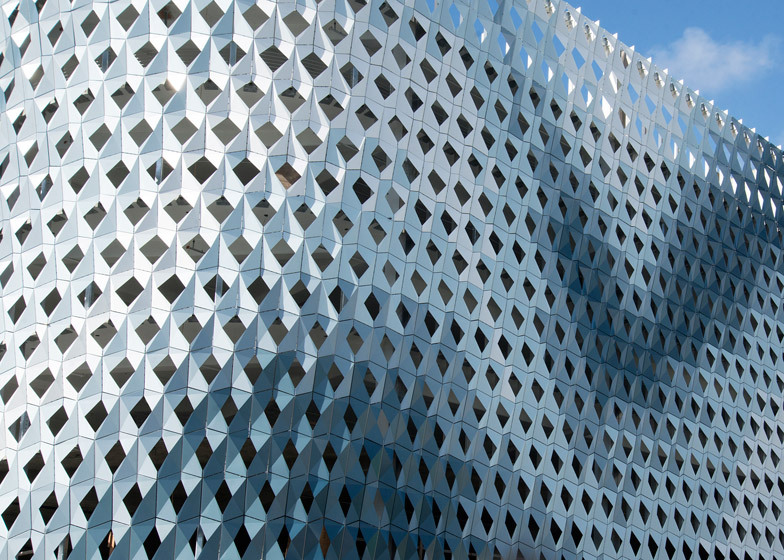 From the east and west, the facades relate to the scale of the neighborhood and appear more like a separate building." 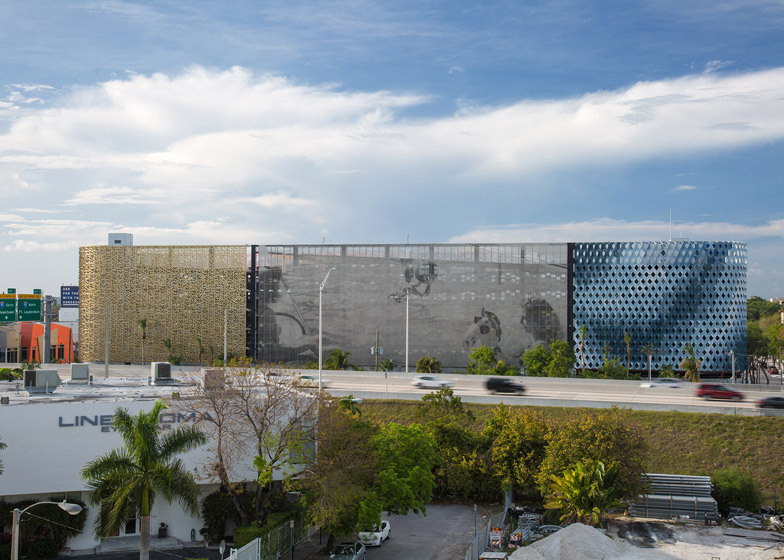 Baldessari, a Southern California artist, designed the perforated metal screen that sits between the other two facade treatments, and also created a beach scene mural on the party wall. 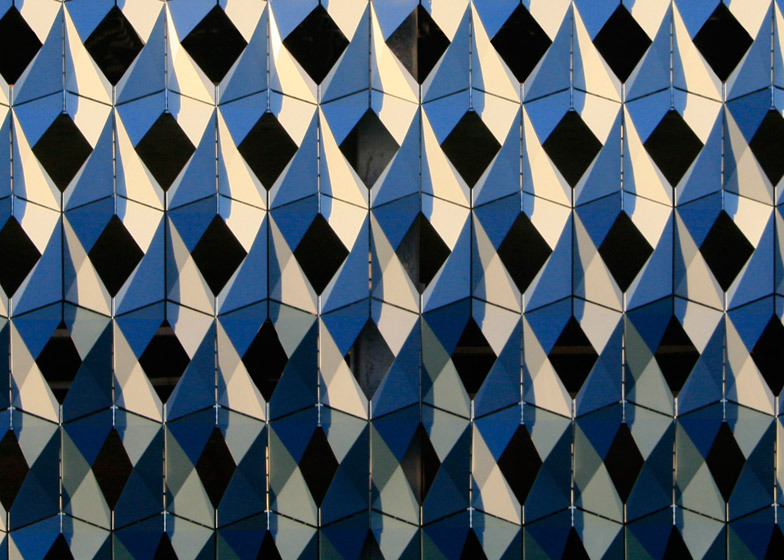 In addition to the parking garage, IwamotoScott designed the exterior of an adjacent six-storey office building. 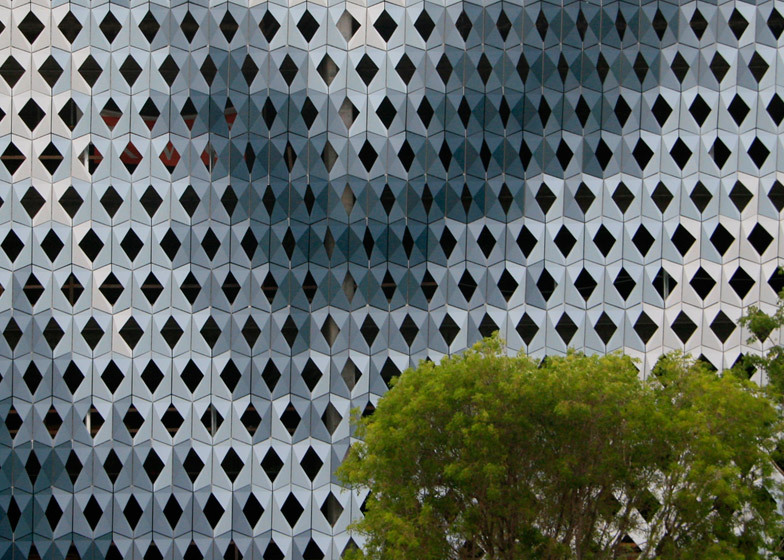 The front facade comprises angled-glass window walls while the rear elevation is defined by staggered, punched openings. 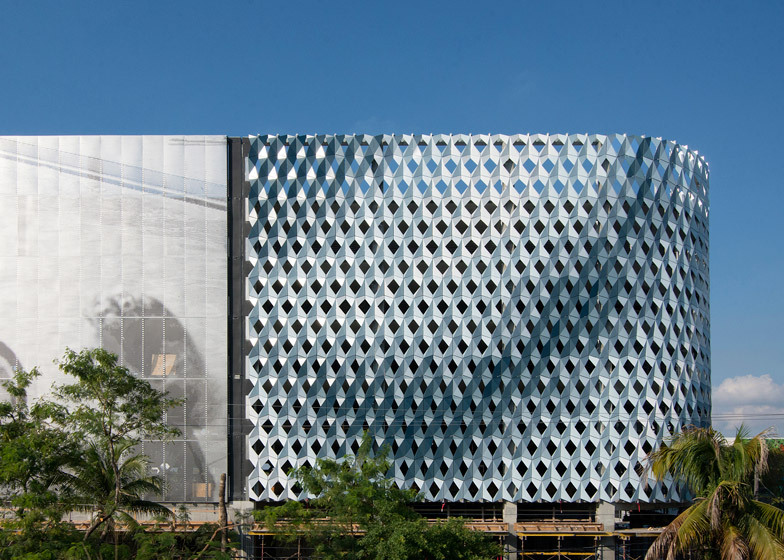 "Working together, the design of the garage and office facades aim to rise to the occasion of the aesthetic ambitions set forth in the innovative redevelopment of Miami's Design District at large," said IwamotoScott. 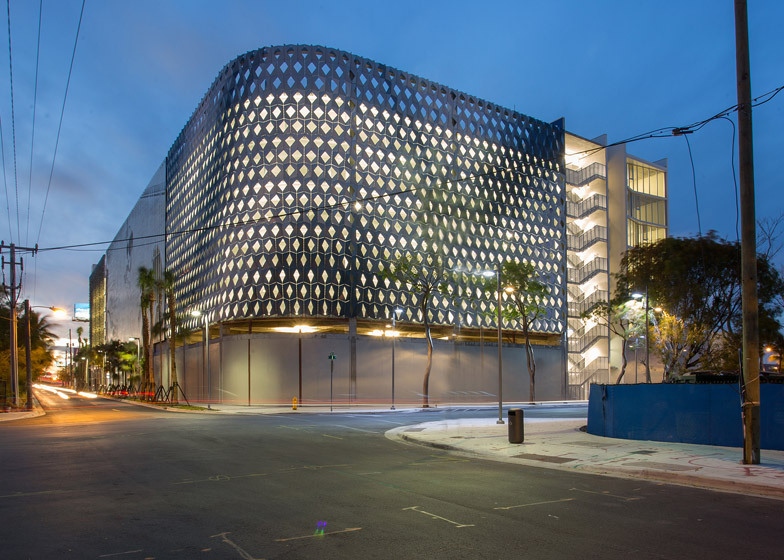 The garage provides much-needed parking for Miami's growing Design District. 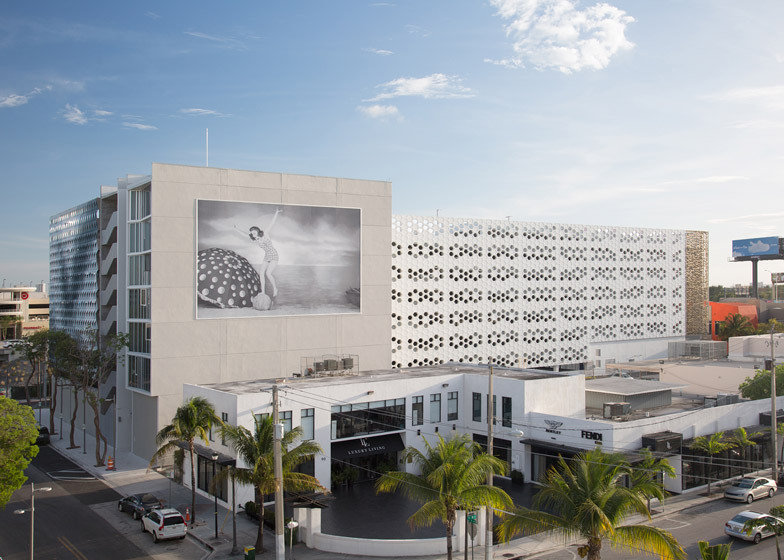 Developer Craig Robins, president and CEO of Dacra, is spearheading the conversion of the district into an international destination. 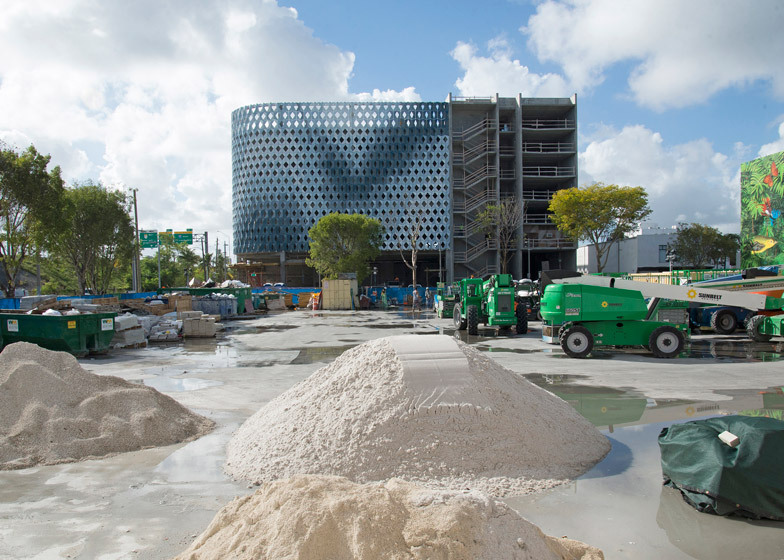 By the end of 2016, the district is expected to offer more than than 120 high-end stores, a boutique hotel, and luxury condos, among other amenities. 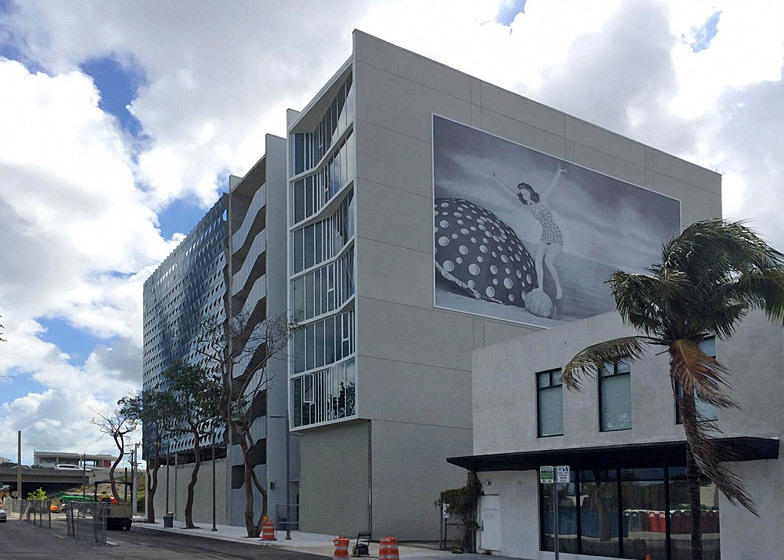 The evolving Design District is just one facet of a larger initiative to transform Miami into a cultural powerhouse, dotted with buildings by high-profile designers. 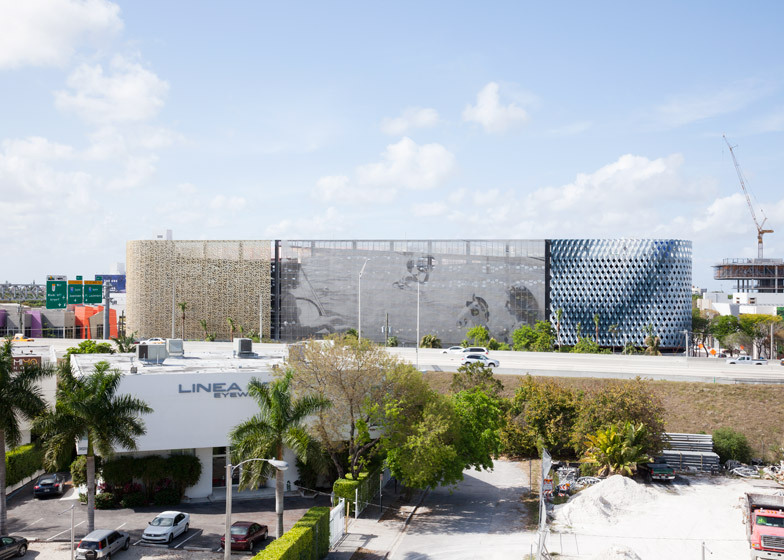 OMA, BIG and Sou Fujimoto are among the architects currently working on projects in the south Florida city.